While the railway network in the United States may not be the most comprehensive, when it comes to epic train journeys there is no doubt that there are some great options available, and the route from Chicago to Seattle is certainly one of those. Passing through some of the great northern cities such as Minneapolis and Spokane, this route follows a path trodden by the great European explorers, as settlers in the region made their push west. Once known as the Great Northern Railway, the backbone of this route was created by James J.
Hill and helped to create a link between the east and west coasts of the country. Passing through seven states and covering a distance of over two thousand two hundred miles, this is an epic journey that last for just under two days, with most journeys taking between forty-five and forty-six hours. Traveling from Chicago, the route takes in the city of Milwaukee before following the Mississippi River for a distance on the way to Minneapolis, where there is a stop for the train to take on fuel and water. As the journey continues the cities and towns along the route become smaller, before the train splits in Spokane, with one part of the train traveling on to Portland, while the remainder of the train takes the route through the amazing Cascade Mountains on to Seattle. Chicago's Union Station is an appropriately grand location from which to depart on a journey of this magnitude, and the grand 1920s scale of the Great Hall is an amazing place to wait for the train. The pillars at the front of the building also show off the impressive history of this station, and it is estimated that over fifty thousand people use Union Station every day. The train terminates at the King Street Station in Seattle, which is a short distance from downtown and is also an impressive station that shows off some of the grand history of the railway in this part of the world. The area around La Crosse is certainly where the scenery of the journey starts to get very impressive, with the Mississippi River and the forest covered mountains making for some lovely surroundings to be traveling through. The Glacier National Park is another attractive highlight of the journey, with some lovely scenes that can be enjoyed from the windows, with the schedule usually timed to try and pass through this area during daylight. The Cascade Mountains offer more spectacular snow-capped mountains and scenery, while the dash into the Cascade Tunnel takes the train under the highest point of the pass. Depending on your preference and your budget, you can usually choose between booking a sleeper berth for the journey, or you can sleep in one of the coach seats during the trip. Booking the sleeper is certainly the most comfortable option, but there are plenty of people who find traveling in the coach seat to be comfortable enough for their needs. The roomettes are the smallest rooms with two bunks and a large picture window, with guests having access to shared shower facilities, while the Superliner bedroom has more space and has access to a private shower and toilet, along with an armchair and a large window. If you are traveling with children, a family bedroom is also available. 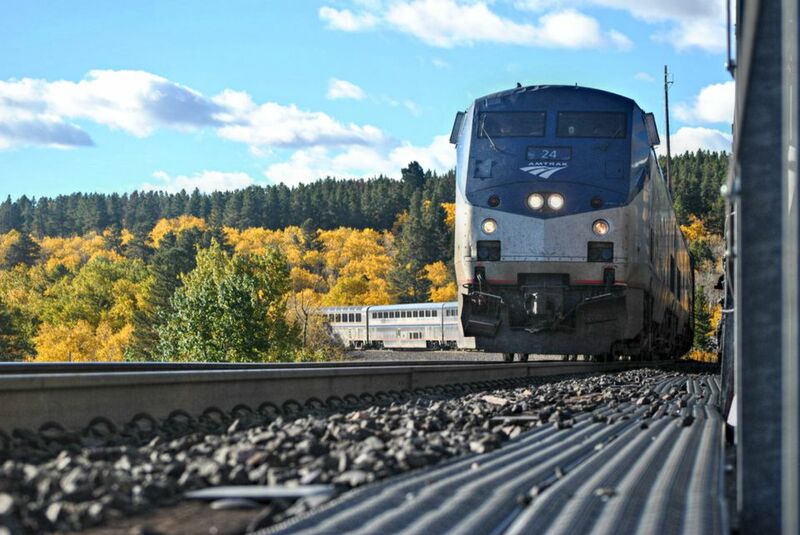 Traveling with Amtrak is often a quirky experience, with rolling stock that can range from almost brand new to trains that are ten or twenty years old. As the company doesn't own the railroads, it can sometimes be delayed by freight traffic. However, those booking sleeper compartments also have all of their meals included, which is very good, and although it may take longer, the comfortable surroundings certainly make for a better experience than flying. Towels and linens are also included, which means that you can also travel with relatively little luggage too.